The register office and council chambers at a borough council in Leicestershire badly damaged in a fire will be demolished. 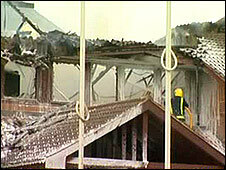 Two-thirds of Melton Borough Council's offices on Nottingham Road were damaged when they caught fire on May 30. It will take several weeks before demolition can begin - and will take about 10 weeks to complete. The council's registration services had resumed, but will now move to a new temporary office on Leicester Road. From Monday, people can register births, deaths and marriages at the new location. The council will operate some services from Melton Mowbray Building Society, and will also use other council premises. Planning services are also up and running - and most planning applications have been retrieved and dealt with. Benefits are being processed as well. The council said land charges and electoral registration are still being salvaged. Ernie White, cabinet member for community services, said: "We are doing everything we can to make alternative arrangements for the registration service in Melton following the fire." Leicestershire County Council is helping couples to find alternative venues for weddings and is also working on getting Leicester Road approved as a site for marriage ceremonies. The council had earlier said that work was on-going to retrieve whatever could be salvaged, like documents and records.